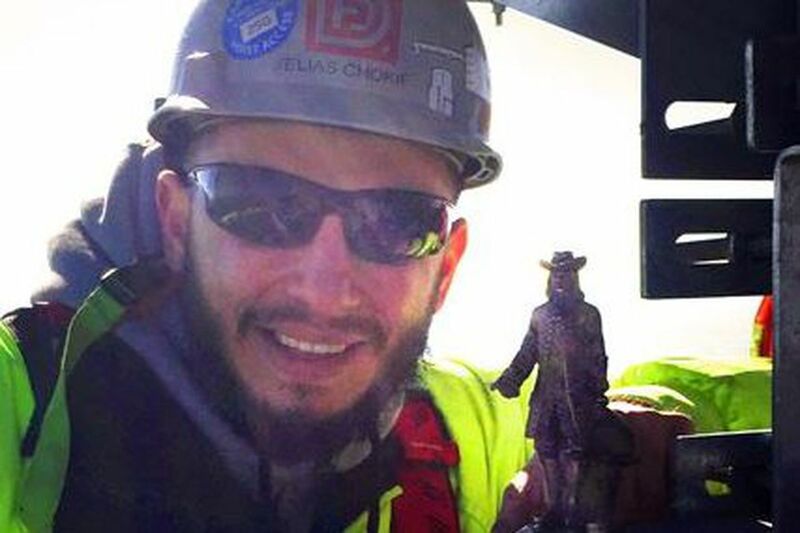 Elias Chokif, assitant superintendent with LF Driscoll, poses with the Billy Penn statue on the top steel beam of the new Comcast tower. Here's the latest from the front lines of Eagles mania. Ironworkers at the new Comcast tower rushed the final steel beams into place over the last two weeks, fearing that a new "Curse of Billy Penn," thought to have doomed Philly sports teams for decades, could sack the 10-1 Eagles before the Super Bowl, construction supervisors say. Will Comcast be unleashed to restrict what other TV viewers see? So on Monday, about 1,100 feet above JFK Boulevard, they affixed a tiny Billy Penn statue (and a Christmas tree) to the highest steel beam, placing Billy Penn in his rightful place overlooking the city from the tallest vantage point. Buy the wings and beer! Plan the Super Bowl party! "They did not want to take the chance and wait for the jinx," Mike Delaney, executive vice president at LF Driscoll, the construction manager for the new Comcast tower, said of the ironworker crews who insisted on moving up the construction schedule to get Billy Penn in place. Comcast's original plan had been to place the last steel beam with Billy Penn onto the new skyscraper later this month as part of an official topping-off ceremony. But with the best-record-in-the-NFL Eagles cruising through victories, addressing the curse seemed more important than waiting, Delaney said. The $1.2 billion Comcast tower is owned by the cable company and Liberty Property Trust. It will be the tallest building between Manhattan and Chicago in the United States when it opens sometime in 2018. The new tower overtook the Comcast Center in height in late October. Comcast spokesman John Demming said on Thursday that "the workers wanted to ensure that Billy Penn was up there for the Eagles and we're totally happy with that." The company most likely is also grateful as it can't now be blamed for a new curse and an Eagles fumble. Demming said that Comcast still plans a lunch and official ceremony to thank the construction workers around the holidays. So for those uninitiated in the superstitions of Philly sports fans, here's an explainer that also can be listened to on the Comcast website in a conversation between Comcast executive David Cohen and sports radio personality Angelo Cataldi. The four-inch Billy Penn statue on the Comcast Center that may have ended the curse a decade ago. Starting in the late 1980s, Philadelphia pro teams were shut out of championships and superstitious sports fans blamed the construction of steel-and-glass Liberty Place One, which broke a centuries-old "gentleman's agreement" that a building would not be built in the city higher than Billy Penn's hat on City Hall. The Wall Street Journal even published an article in June 2007, asking in its headline "Does the Curse of Billy Penn Continue to Haunt Philadelphia?" That same year, the cable and entertainment giant sought to correct the apparent evil spell on Philly pro teams when it opened the new Comcast Center, then the tallest building in Philadelphia and the company's headquarters, by placing a four-inch Billy Penn statue on its roof, restoring Pennsylvania founder Penn to his aerie place. Lo and behold, the Phillies beat the Tampa Bay Rays for the World Series the next season, in 2008.